We’re delighted to announce that the Times Square Official Website won a Bronze Award at the International Economic Development Council’s 2018 Awards in the General Purpose Website category. 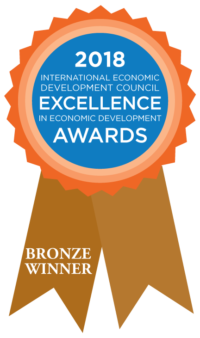 IEDC’s Excellence in Economic Development Awards recognize the world’s best economic development programs and partnerships, marketing materials, and the year’s most influential leaders. These 34 awards honor organizations and individuals for their efforts in creating positive change in urban, suburban, and rural communities. The Times Square Alliance and I-SITE partnered on the redesign of the official Times Square website that serves both the 230,000 ‘locals’ who have made the area their home or place of work, and the close to 50 million visitors from around the globe who visit each year for the truly unique Times Square experience. The website is a key vehicle for economic development for the district through driving commerce, business attraction, real estate development and programs and events that create jobs, build the tax base and improve the overall experience of anyone who lives in, works in or visits the Crossroads of the World that is Times Square. Read more about the project and visit the website. Since launch in late 2017 the website has received numerous awards including Best Regional Website at the 2018 WebAwards, and Best in Category (Towns & Municipalities) at the 2017 Horizon Interactive Awards.